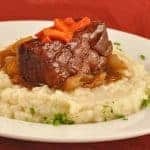 Tender, rich and flavorful pork belly braised in a blend of aromatic vegetables, apple cider and spices and served over cauliflower puree and caramelized onions. Preheat the broiler and position the rack about 8 inches below the heat. Score the fat side of the pork belly 1/4-inch deep in a cross-hatch pattern and season liberally with salt and pepper on both sides. Place on a foiled lined broiler pan and broil, fat side up until golden brown, about 10 to 12 minutes. Turn over and broil for an additional 8 to 10 minutes. Remove from the oven and reduce the temperature to 300°F. Heat the cider and 1 cup of the chicken broth to boiling in a dutch oven. Remove from the heat and add the cinnamon, allspice, cloves, carrots, celery, onion and garlic. Stir to combine and add the pork belly, fat side up. Add enough additional chicken broth to bring the liquid level just below the top of the pork belly. Cover and bake for 3-1/2 hours, removing to baste the top of the meat every hour. After 3-1/2 hours, uncover and continue cooking for 1 more hour. While the pork belly is braising for the last hour, bring the cider, sugar, cinnamon and ginger to a boil in a saucepan. Reduce the heat and simmer until the liquid has reduced and thickened to a syrupy consistency, about 20 minutes. Remove from the heat and set aside. Remove the pork belly from the oven, discard the aromatics and braising liquid and slice the meat into 1-1/2 inch wide pieces. Heat the cider glaze over medium heat and add the pork belly, two pieces at a time, turning with tongs to coat thoroughly with the glaze. To serve, plate a portion of Cauliflower Purée (see below), top with a spoonful of Caramelized Onions (instructions follow) and a piece of pork belly. Garnish with Roasted Carrots (recipe follows) and some chopped parsley.